The Carnegie building, which has an added extension, was opened in 1905 and since then has undergone various remodelling projects, but this is the first major refurbishment since the 1970s. The catalyst for the refurbishment was the relocation of the Community Opportunities service, for people with physical and learning disabilities, from its existing out of town location to the more central library, bringing service users into the centre of their community. The introduction of a retail space was a step change for the library service and they have creatively used legacy slatwall with lighting and signage to create a mini-store in the library. 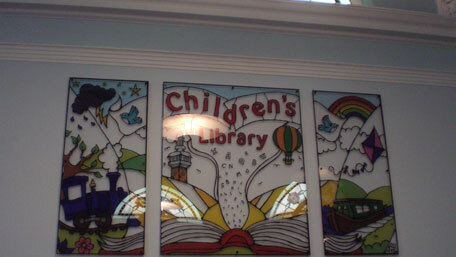 The superb domed area in the original Carnegie building is dedicated to the children’s library. With magnificent stained windows this was an opportunity to harness Demco’s creative skills and produce a modern stained glass effect in Perspex. Hand drawn by Demco’s designer Michelle Easterbrook the artwork features landmarks from the region, including the Carillon bell tower, which is located in Queens Park opposite the library, a steam train to reflect Loughborough’s preserved railway, the canal, and even some initials of staff who work in the library! All furnishings in the library are on castors so they can be moved around to house different events. A recent initiative was a Ladybird Reading event in the children’s library and local drama students performed a cameo of Sue Townsend (who herself is from the region) and her novels for their end of term exams. Workshops, storytelling, African drumming, craft fayres and creative workshops have all taken place in the new space. One of Demco’s designers, Steve Beasant, worked with the team to evolve a space that is open, modern, bright and fresh with the flexibility that helps the library deliver a modern, relevant library service.